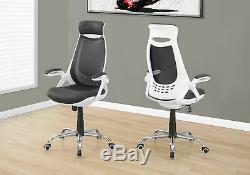 Monarch Specialities Office Chair - White / Grey Mesh / Chrome High-Back Exec. Elevate your office space with this modern ergonomically designed high-back executive office chair in a chic white and dark grey finish. BIFMA certified for commercial or home office use, this on-trend designed chair is not only fashionable but supremely comfortable with a natural curved padded back, head rest, and arm rests that swing back, along with a thick cushioned seat all upholstered in a durable and breathable commercial grade dark grey nylon mesh fabric. The convenient side lever allows you to easily adjust the seat height between 19.5"-23" with a free/lock-in tilt back mechanism to recline for added comfort. The 5 nylon hooded castors on a sturdy chrome base give a smooth movement across the floor or low pile carpet. Easy to assemble, you deserve to be sitting comfortably and in style as you work hard to close those deals! Back and seat upholstered in durable commercial grade gray mesh fabric with a thick cushioned seat. Ergonomic curved high back rest and padded arm rests for added comfort. Convenient lever for adjustable seat height with lock-in/free tilt back mechanism. 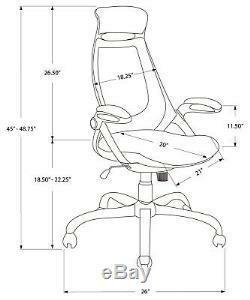 Seat height: 19.5"-23"H; Seat dims: 20"Lx22"Dx28.5"H (back rest); Arms: 10.5"L (9.5L" padded)x2.5"Wx8H. Material: Mesh, Chrome Metal, Nylon, Foam Color: White Assembly required: Yes. Product Dimensions - 27 x 24 x 50 in Product Weight - 31 lbs. 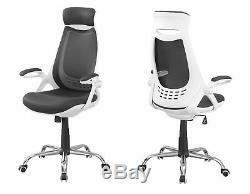 The item "Monarch Specialities Office Chair White / Grey Mesh / Chrome High-Back Exec" is in sale since Monday, June 6, 2016. This item is in the category "Home & Garden\Furniture\Desks & Home Office Furniture".